I've only just noticed the comments on this blanket, and I'd like to apologise to everyone looking for guidance. I originally put in kitchener stitch, but what I meant, when I wrote the pattern, was mattress stitch. I was a newer knitter and I confused the two terms when I published this. There are also many concerns regarding how "square" the squares are. If you find that your squares are a bit too rectangular, simply add a couple extra rows to the top and bottom of the block and it will evenly square out for you. Every knitter's gauge is different. Modify easily by adding rows. It won't ruin the pattern. Just make sure to add even numbers of rows to the top and bottom of each heart, or to the bottom of any other square. I hope this cleared up a bit of confusion. If anyone has questions, please contact me on Ravelry as jupe. Now, back to your regularly scheduled blanket. 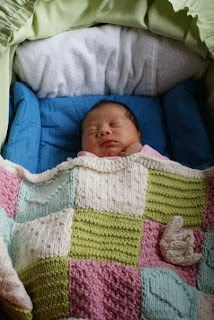 Our friends, Joe and Diana, were finally having a baby - a little girl. I decided quickly that I wanted to knit them a baby blanket to keep her warm and cozy. After mulling over the fastest and easiest way to make a blanket, I decided on a series of textured squares, a bulkier yarn, bigger needles, and simple patterns. The blanket turned out beautifully. It seems to be a reasonably big hit on my Ravelry page, so I've decided to finally make the pattern available for anyone else who wanted to knit one like it. Follow chart as above. On the right side, knit the knits and purl the purls. On WS, purl the knits and knit the purls. Secure the flower to a pink square. I am knitting this gorgeous blanket at the moment, and just wanted to let you know that the white square (written instructions)..If you knit row 1 to row 9 then repeat...you will end up with a garter ridge (rows 9and 1 are both knit)...I just omitted row 9, so only did rows 1 to 8 then repeat...funnily enough, the graph is correct!!.. Thanks for sharing this pattern...its looking great so far...will send you a pic when its finished. how do you kitchener stitch the squares together when this type of stitch is meant for "active" stitches still on the needle? Unless I'm not understanding what a kitchener stitch is. I actually have the same question that was also posted there. Do I kitchener stitch the rows as well. How do you attach the 5 rows? I'm fairly new to knitting so I apologize if this assumed somewhere. Thanks! Is there another yarn that you would suggest? I can't find any close by. Would any cotton yarn work? I want it to be soft...any suggestions? je me suis permis de mettre le lien sur mon blog. I have the same question as above about how to kitchener stitch the squares together as they're already off the needles... thanks! I really love this baby afghan, but I can't figure out how to print this either! I have tried cut & paste, but it won't paste. I was able to get this to copy, paste and print. It isn't great how it transferred, but it worked- so if you still have trouble, email me at villantimom@gmail.com and I'll try to forward it to you. I'm also confused as to how to put them together with the kitchener stitch if you've binded off each piece. I'm going to crochet them together like granny squares. I did that on another similar blanket and it was awesome- really gave it a quilted look. If you're having trouble copying and pasting, drag your mouse over the pattern to highlight it all, then go to your print button and click 'Print selection'. Voila. Works in IE anyway. Please can you explain how to kitchener stitch the squares together? Do you pick up stitches around the edges? Do you slip the AND last stitch of every row? When I slipped the first stitch of every row on the pink squares, it made a cool diagonal-line pattern instead of the mini-basket-weave-look. I do like it though, happy accident! It's best to slip the first stitch in every row in order to pick them up easily when it's time to seam them if you have trouble picking up stitches that have been knit. On the heart square there are no directions but if you knit continously you end up with garter stitching? Can you please explain this to me? Knit on the right side and purl on the wrong side. if you knit on the wrong side, you'll end up with garter stitches. Does anyone have the heart block written out? I've tried doing it so many times and it doesn't work out. I'd appreciate the help. @Elizabeth - Have left the heart squares until last! I'll be writing it out as a pattern, shall I post it on here for you when it's done? Im mostly a crocheter... but do knit well too... however.. I was just wondering about the size of the squares and are they "square" I have just started the first squares doing 22 stitches and 20 rows but it looks like a rectangle rather than a square.. is this correct???? 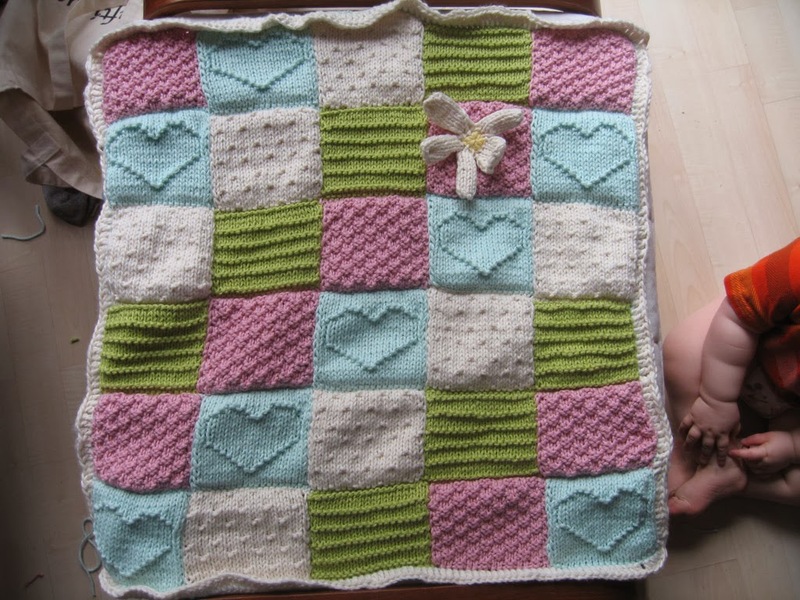 Could you please someone tell me how to knit the heart square and post it in here so I can make the heart to go with the blanket ! Thank you ! I'm knitting the heart square and everything was working out until I got to the ones 4 stitches from the edge. I've ripped it out many times, as it doesn't look correct. I'm knitting the purls and purling the knits, as instructed. I've even not done the pattern on the purl rows, just on the knit and it's still not right. I think it might have something to do with the succession of the column. The only thing I might try is to fill in the heart to see if it looks better. Any suggestions? You have to still follow the pattern but you knit the stitches on the right side and lurk then on the wrong side. I meant purl them on the wrong side, not lurk!! Meaning you use the pattern for every row not just the knit ones. the sewing together part. Would you be able to explain a little more? If I stitch to the center, the white will show? This blanket is beautiful. Had to adjust the squares, but it came out beautiful. Hi, I'm a bit lost when reading the pattern for the white squares which is correct the written pattern or the graph as it states on row 2 P2 *K1 P3* rep to end if you look on the graph this does not correspond. Many thanks. Hi. Has anyone written the heart instructions out? I've just tried it with some spare wool but the stitches at the sides of the heart(4 stitches in from the edge) have come out looking different to the picture. I've tried to follow it the best I can! Can anyone help me with this? The pattern for the pink squares is only a ribbed pattern, not like the picture..can anyone help please?